People in today’s world are switching from one mobile to another with the emerging of new models in the market. In that case you need to transfer all the contact list, calendar, SMS, messages and apps from your old phone to new ones. But to upgrade the data from an old version to the new version of your phones is harder. However, it is much harder to transfer the important details while switching from one operating system or manufacturer to another i.e. from iPhone (Ios) to Samsung galaxy s4 (android). But with the advancement in technology the process of transferring data contact details from one mobile to another has made easy, quick and simple. Step3: Open the CopyTrans Contacts page and connect your iPhone to the computer. This software will show the list of contacts that are on your iPhone. Now, select the contacts you would like to copy it to your Galaxy S4. You can even select all your iPhone contact address at a time by clicking on the box that is beside contacts. Step 7: Transfer of contact from iPhone to Galaxy S4 is completed successfully. 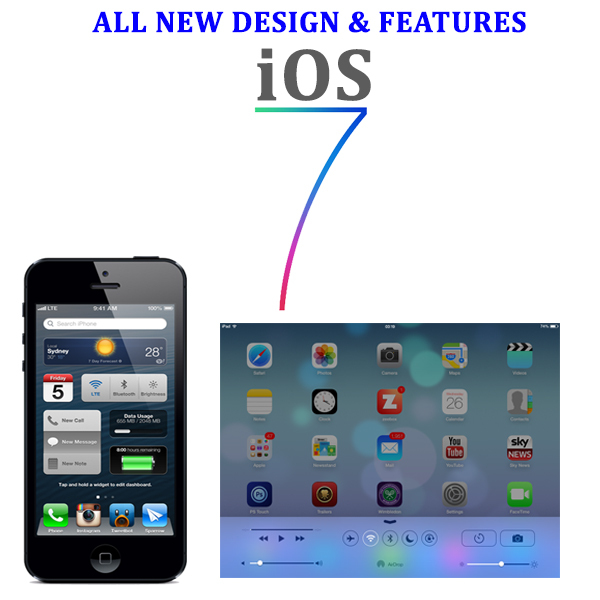 The iOS 7 mobile phone operating system supports the iPhone and the iPad mini electronic devices. These devices are manufactured by the reputed multinational electronic manufacturing company Apple Inc. These are called the smart phones as they are powered by the Android mobile phone operating system. It is immensely popular all over the globe. Certain tricks to speed up the iOS 7 on iPhone and iPad mini are as follows. These are all very simple methods. The background app should always be refreshed in order to start a totally new application on the iPhone. The system may get slower if all the apps which are not in use run simultaneously with the current app. Thus, refreshing the apps page newly speeds up the whole system to a very large extent. The auto updates should always be turned off in order to speed up each and every uses and applications on the iPhone. It saves a lot of memory space within the processor of the mobile phone and thus the mobile phone operation becomes faster and easier with the help of this activity. A few of the most essential auto updates should be kept while others may be turned off in order to speed up the iPhone operation speed. The apps which are no longer in use should always be cleared up from the memory of the Apple mobile phone or the iPhone. As a lot of memory space and address will be freed by this way, the entire process will be speeded up to a considerable extent. It also lowers the burden of extra junk and unwanted apps on the entire iPhone mobile system. The memory of the iPhone can be enhanced by adding more memory chips to the device. Thus, the speed of the iPhone will always automatically increase in this way. iOS7: What’s hot? What’s not? iOS 7 is now available to download, Apple claims there are over 200 new features in its new iOS7. iOS 7 introduces new features like Control Centre, AirDrop for iOS and smarter multitasking. It makes the things you do every day even easier, faster and more enjoyable. And while many of the apps look different, the way you do things feels perfectly familiar. So from day one, you know how to use iOS 7. 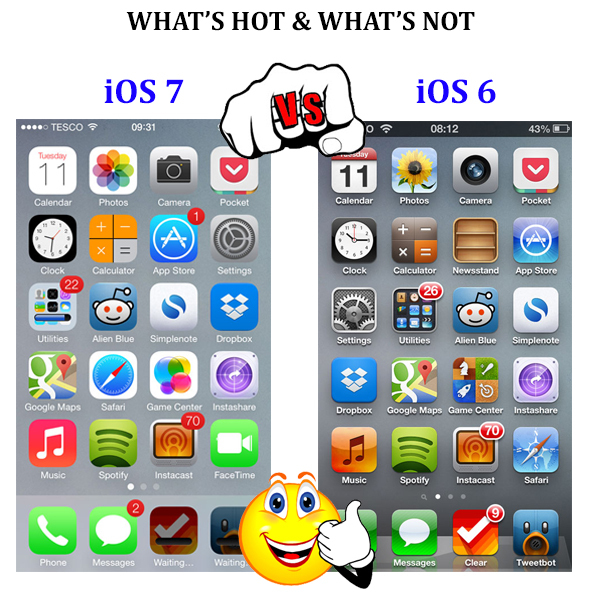 We at PrePayMania did a thorough research on the OS and we bring to you “What’s hot and what’s not” about iOS7. Multitasking has improved- Of course you have heard it. Double tapping on the home button no longer gives you the tray with the applications opened; now when you double tap on the home button it gives a full screen, thumb nail view of all the recent apps. Control Center is one of the biggest feature additions to iOS7. It’s a drop down feature that gives the access to almost all other features of your device. Users can now enable Airplay mode, WI-FI, Bluetooth, Do Not Disturb, and the screen orientation lock from Control Center by swiping up from the bottom of the screen. Siri can now pull information from Wikipedia and display the recent tweets from a specific account with simplified commands. Performance has been improved in some areas, with Siri detecting inquiries faster. Siri has a new male and female voice as well. AirDrop allows users to directly connect with other devices and transfer files wirelessly. A feature which was missing from iOS since ages. Facetime is available for voice-only also. It would not only be easy to connect but would also eat up less data. Camera was never so easier to use. With just one touch you can toggle between camera, video and panorama features. Photos app No need to mess up your photos now. Photos will be stored according to the time and place they were clicked. They will be stored in albums and you can tap on years and you will be able to see photos of that year. Sharing is not caring for Apple. It’s OK when it comes to share photos on social networking sites. Apple is very less friendlier when you want to share data with other devices. Battery life We’ve heard that iOS7 is hitting hard on the battery life for most of its devices. We will only have to wait for it for the news to get confirmed. Even though there is a lot of scope for improvement, we won’t deny the fact that this OS is the biggest overhaul ever by Apple. Apple has launched its new iPhone 5s the latest iPhone in the series. At the same time Samsung has launched its Galaxy note 3 in around the same price zone. 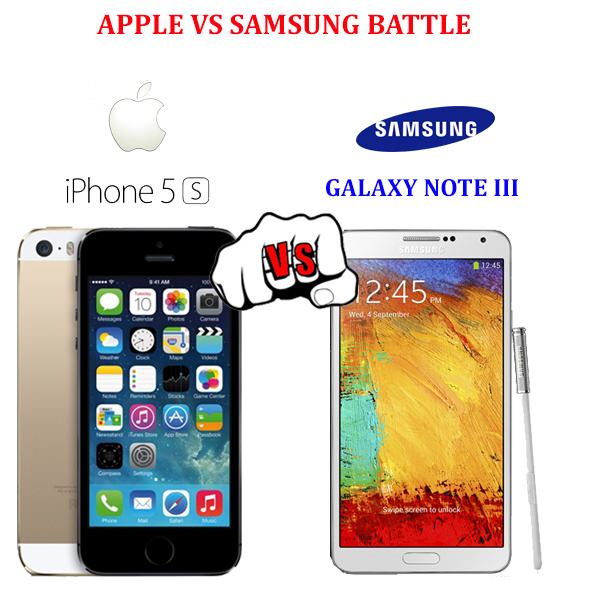 Both devices are extremely powerful and best in their class, but there are few important reasons why iPhone 5s beats Note 3. 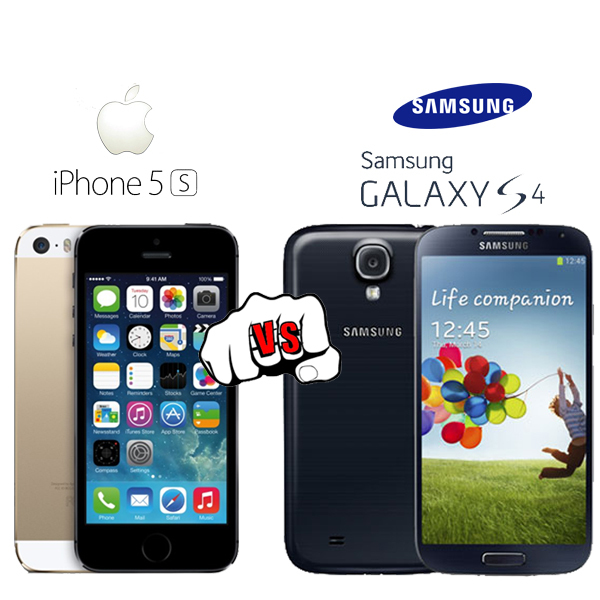 The iPhone 5s retains the same design as iPhone 5 at the same time Samsung note 3 is slimmer than its previous version. The iPhone 5s weighs 112 grams that is much less than note 3 weighing 168 grams, making the device lighter in use. The screen size of note 3 is 5.7-inch whereas of the iPhone 5s is 4 inch same as iPhone 5 making it very easy to operate with one hand. Galaxy Note 3 is also very difficult to keep in pockets because of its massive size whereas the slim and trim iPhone 5s is easy to handle. The iPhone 5s has three color variants that is one more than its previous version. Every apple phone comes with a remarkable new technology. Apple kept its promise by providing fingertip recognition home button an, entirely new technology absent in any smartphone till date. Samsung Note 3 was rumored of having this technology but ultimately company was unable to put it in. Also the iPhone 5s has an 8 megapixel iSight camera capable of capturing photos even in low light with its dual-tone flashlight. The camera lens of note 3 is not as good as that iPhone 5s’s. Talking about one of the main features- the operating system of the phone of the Note 3 will feature the same OS as Android 4.1 Jellybean as its previous version note 2. The new iPhone 5s features the all new IOS 7 with numerous new features that the IOS 6. Samsung is going to launch one of the most awaited Smartphone’s in the market in just some days and every Smartphone lover is waiting for this phone so that they can compare it with the most popular phone of Apple that is iPhone5 so that they can choose the best Smartphone of the season for themselves. 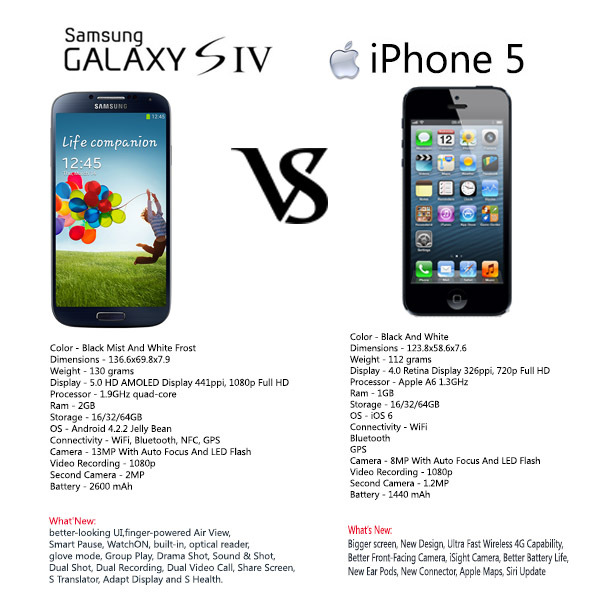 Samsung and apple have always been in the competition for coming up with the most advanced Smartphone’s. The Apple iPhone 5 was unveiled in September and is considered to be the first iPhone to feature a large display. It comes with a 4inch display while the Samsung Galaxy S4 is said to have either a 4.99-inch or 5-inch display. Apple iPhone 5 SIM Free comes up with an aluminum back along with a glass and metal band which makes it standout when it comes to style whereas it is said that the galaxyS4 uses the polycarbonate material as it is durable and allows the users to install their own extended battery. The apple phone comes up with a 1440mAh non removable battery while the Samsung phone sports a 2600mAh removable battery which gives the users a chance to fit in their own extended battery. The iPhone features an 8 rear megapixel camera alo0ng with an HD front facing camera while the new galaxy phone features a 13 megapixel camera. The main feature which will draw your attention is that the Samsung Galaxy S4 features a quad core processor while the Apple iPhone features a dual core processor which means that the Samsung offers you with better multitasking and gaming facilities as well as a better battery life. The next feature about the new Samsung phone is that it is said that this phone will come up with a wireless charger kit. This particular feature is not available in the Apple phone because of the non removable back. This way the two best Smartphone’s will be in competition in the market. Let’s see who wins the battle. Apple has been a market leader in the industry of technology. The company so much believes in perfection that it competes with itself to get better and provide its users with the finest gadgets ever. This can easily be proved by the efforts and hard work the technicians have put in the research and development of iPad Mini to make it better and overcome all its shortcomings to let the user experience the desired satisfaction by using it. 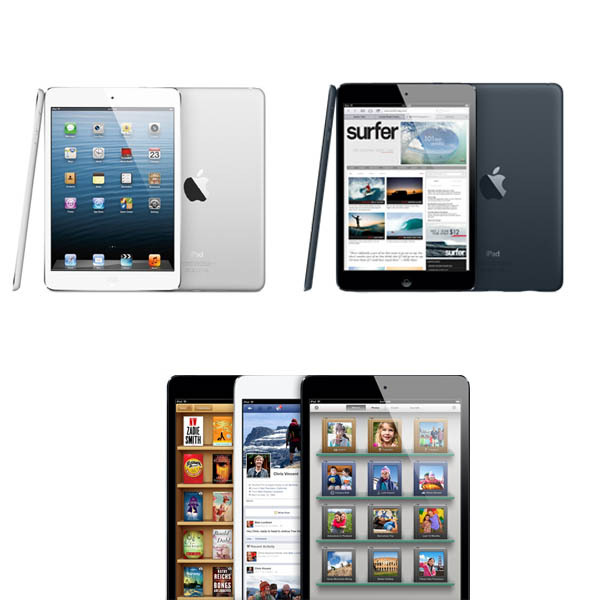 The current version of iPad ‘Mini’ comes with a seven point nine inch screen which is quite smaller to iPad 4 of Apple. With the limitation of the size of the screen that this mini version of iPad has, it is obvious that the retina display will not able to compete with the bigger screen sized 4th edition of iPad. According to some Chinese language research, there has been some news in the market that Apple is enhancing the retina display of its mini version of iPad which will have the capacity to even surpass the current retina display of the 4th edition of iPad. The 2nd edition of mini version of iPad is expected to have a retina display of three twenty four pixels per inch (PPI). The current version of mini iPad has a resolution display of 1024 x 768 screens which is now going to be enhanced to 2048 x 1536 display screens. The enhanced screen resolution of this mini iPad 2 is thus, expected to be double of what it is now. Also, Apple is striving to have a three twenty four pixels per inch retina display of mini iPad 2 which will exceed the two sixty four pixels per inch display of Retina iPad. This display gets very close to the three twenty six pixels per inch display of the iPhone. The reason behind putting in all these efforts is because of the criticism that mini iPad has received for its screen display of mere one sixty three pixels per inch. Moreover, the mini iPad was being overshadowed by the two major products of Apple – 4th edition of iPad and iPhone 5. Apple being known for the quality of its products is keen on ensuring that the high standards set for its retina display of its products is maintained.